The route includes sites in Oak Ridge, Knoxville and the Smoky Mountains. It combines other state trails, state and national scenic by-ways and stand alone sites to make up the Tennessee Heritage Trail. Like other auto tours and trails it's not one that has a beginning, middle or end. You can make up your own route by including sites on the Tennessee Vacation website. Quilts and history hold a special place in my heart. Blogging has helped me discover more about the role our state history has played both locally and nationally. I grew up hearing about the role we played in giving women the right to vote and about the impact our state has had on country music. However, I did not know about the role we played in the early development of the country (see my article Sycamore Shoals and Elizabethton) . I also didn't know about the role of Fort Loudoun had on early relations with the Cherokee. 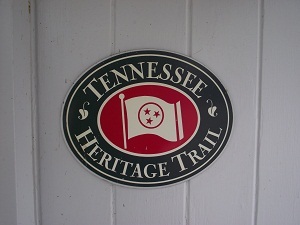 Parts of the Tennessee Heritage Trail include the Glory Land Road in the Chattanooga area, the Overmountain Victory National Historic Trail, scenic byways, Quilts in the Smokies in Jefferson County and others. I've been on a few of these and to me, they all sound interesting.